In my opinion chocolate and pumpkin go together as well as chocolate and peanut butter. I say this because I’ve made a few desserts that have used this combination and they all turned out delish – Pumpkin Brownie Swirl Pie and Chocolate Pumpkin Crepe Cake. There was also the Pumpkin Chocolate Brownies I made that tasted good but required a vast amount of ingredients and ended up being undercooked in the middle. I may have to revisit that recipe since it did taste good but just needed some tweaking. So, it should be of no surprise that I finally decided to make a simple chocolate cake with a pumpkin filling. 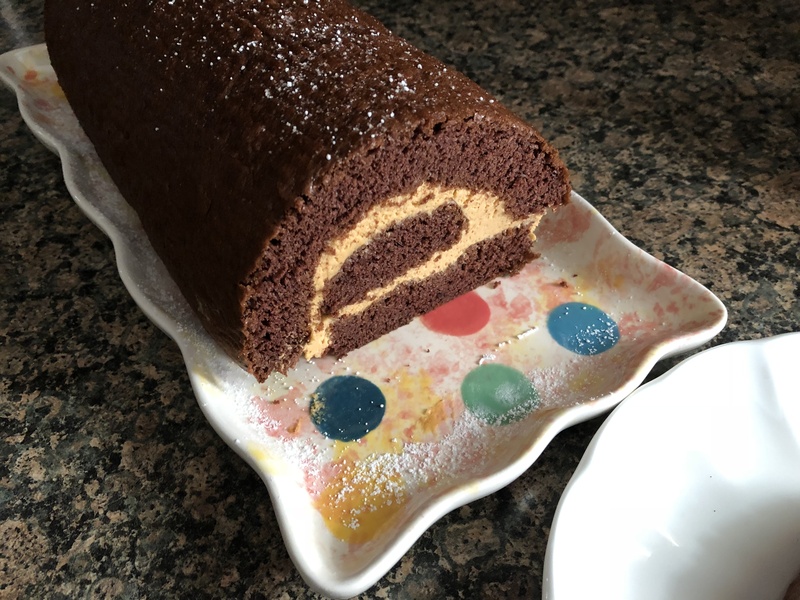 Well, not completely simple, a Chocolate Roll Cake, which is easy to create but just looks fancier than your everyday layer cake. 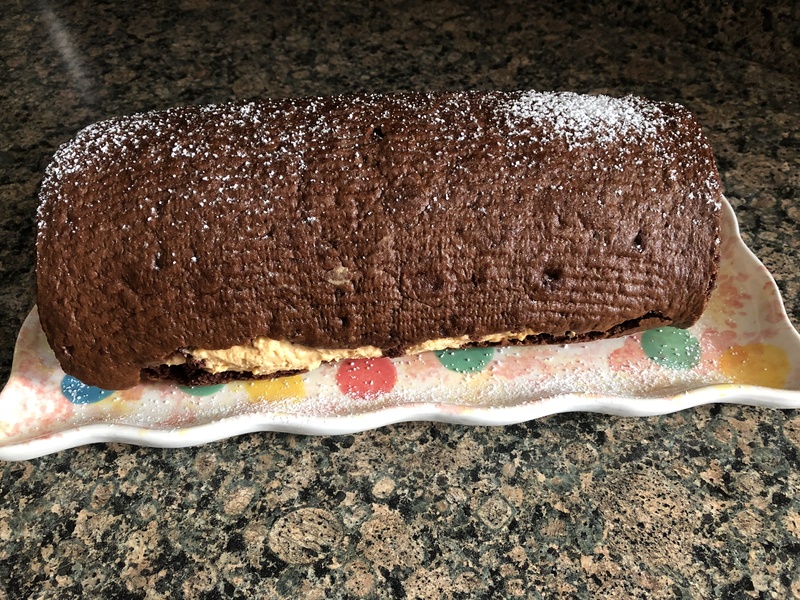 Using a devil’s food cake mix, I made the chocolate cake in a jelly roll pan. While it was baking I prepped a clean kitchen towel by sprinkling it with confectioners’ sugar. Once the cake was finished baking I immediately flipped it on to the towel and rolled the cake along with the towel from one short end to the other and placed it on a wire rack to cool for an hour. While the cake was cooling I made the pumpkin spice mousse and refrigerated it. This is the same mousse I used as a filling for the spice cupcakes I posted about almost two weeks ago. Unfortunately this was my last box of Pumpkin Spice Jell-O pudding mix. I have searched and just haven’t been able to find it at any of my local supermarkets. I’m not giving up hope though. As an aside, if you’re not a pumpkin fan or can’t find the flavor by you as well use another flavor of Jell-O pudding. The recipe and directions are the same. I went on their website and was surprised to learn of all the flavors they make that I have never seen in the supermarket – cheesecake, red velvet, coconut and strawberry crème just to name a few. Here’s a link to the complete selection. 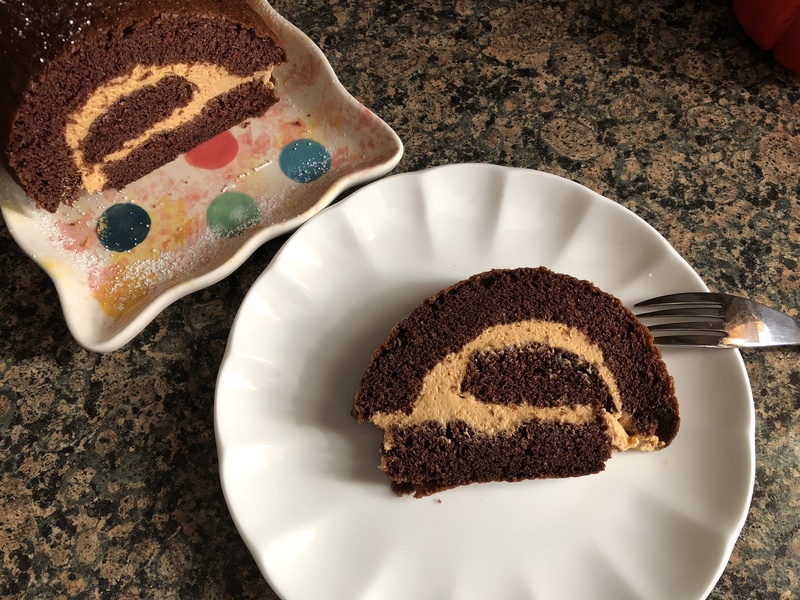 Once the cake had cooled I unrolled it and spread the pumpkin spice mousse on it leaving a small border around the edges so the mousse wouldn’t spill out when I rolled the cake once again. I used most of the mousse. I then rolled the cake again (without the towel). Placed it on a serving dish and sifted confectioners’ sugar over it. Now, as you can see my cake did break a bit when I re-rolled it. If this happens don’t despair just position the cake on your serving dish with that side down. And when I sliced into it you barely noticed the tear. The roll design was still visible and more importantly the cake and mousse tasted delicious and that’s what really matters! Bake 14 to 16 minutes, or until the cake springs back when lightly touched in the center. Turn the cake out on a clean kitchen towel sprinkled with the confectioners’ sugar. While the cake is still hot, carefully roll up the cake and towel together from one shorter end to the other. Cool completely on a wire rack for 1 hour. While the cake is cooking make the mousse. Combine all of the ingredients in a medium bowl and beat with a hand mixer on medium speed until thick and smooth. Refrigerate until ready to use. After an hour, unroll the cake carefully and remove the towel. Spread the pumpkin spice mousse evenly over the cake and roll it up once again. Dust with confectioners’ sugar and enjoy!